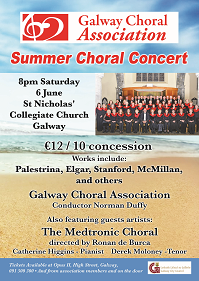 Galway Choral Association’s Summer Choral Concert will take place at 8.00pm on 6th June in St. Nicholas’ Collegiate Church. Luscious arrangments by Malcolm Sargent and Roy Ringwald of African American spirituals “Deep River” and “Little David, Play on Yo’ Harp”, Palestrina’s “Alma Redemptoris Mater” and James McMillan’s “So Deep” form part of a collection of new and old favourites. The choir is conducted by musical director Norman Duffy. Special guests include Medtronic Chorale, winners of Galway Choir Factor 2015, under the directorship of Ronan De Burca, who will also provide piano accompaniment for the evening. The Association takes great pleasure in showcasing the outstanding up-and-coming young pianist Catherine Higgins from Salthill. Limerick-based tenor, Derek Moloney., who sang at the choir’s recent performance of Orff’s “Carmina Burana” and Poulenc’s “Gloria” which raised over €1500 for Cancer Care West, is also performing. “Palestrina’s setting of the Alma Redemptoris Mater is challenging to sing, and an uplifting experience for every audience” said musical director Norman Duffy. “Written in the Renaissance period, it is an extremely melodic and fluid choral work ideally suited to a cappella performance in St. Nicholas’ Collegiate Church. Indeed, many of our pieces will be performed unaccompanied at this concert, which is a new departure for our singers”, he said.